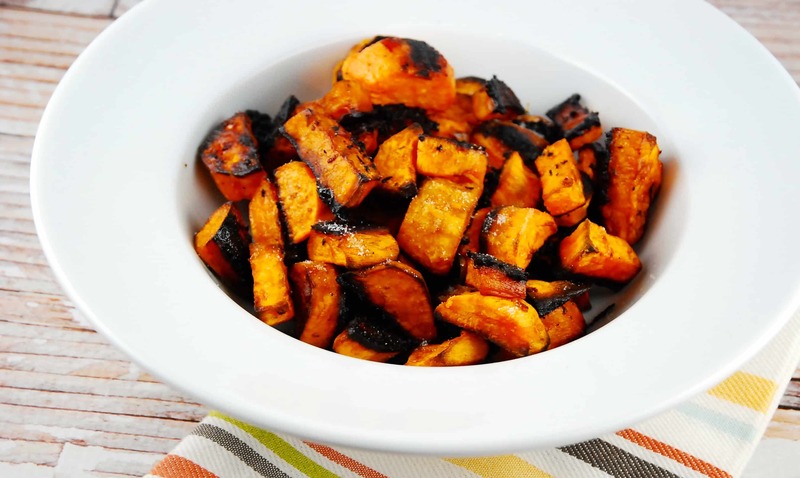 If you are looking for a healthy Thanksgiving side dish recipe this year, these Balsamic Roasted Sweet Potatoes are a fantastic alternative to candied yams. Yes, I know traditional candied yams are swimming in butter and melted marshmallow and nothing can quite compare to that, but these sweet potatoes are a LOT better for you and a great way to help you stay on track this holiday season. Plus, they are incredibly easy to prepare, requiring just 3 steps and a small handful of ingredients…most of which you probably already have on hand. And they are so delicious, you won’t be making them just at Thanksgiving. Enjoy! This easy to prepare side dish is a great accompaniment to many meals. Tender sweet potatoes roasted with garlic and balsamic vinegar makes for the most amazing flavor combination. Preheat oven to 425. Line a large baking sheet with parchment paper or foil, and mist with non-fat cooking spray. In a large bowl, combine the potatoes with the remaining ingredients. Toss well to coat. Evenly spread potatoes onto baking sheet. Place in oven and roast, turning frequently, until the potatoes are soft and golden brown, about 25-30 minutes. Hi, I love so many of your recipe’s but every time I try to print one of them I just can’t get it to work. I would like to be able to print just the recipe and not the whole article. Is there something that I’m missing or could do to remedy this problem? Susie Buckethal right click to highlite the recipe. open microsoft word paste and print.